which was celebrated with an international conference on Kharazmi on April 24, 2018. Kharazmi university was the home of the well-known Iranian historian of mathematics Gholam-Hussein Mossaheb, whose book on Omar Khayyam is available online. This webpage is dedicated to the medieval mathematican and astronomer Muhammad ibn Musa (al-)Khwarizmi (or Kharazmi), who is mainly known for his treatise on algebra and his text on Hindu-Arabic numerals. In the process of the transmission of this text to the West, his name was garbled to "algorism" and further to "algorithm". Al-Khwarizmi was also an important astronomer. In this webpage we provide information on his original works in Arabic, and on modern translations of his original works, for the benefit of those who want to read his works as close as possible to the original. We have added scans of sources which are not in copyright (if one of these sources is in copyright we ask the publisher to let us know so we can remove the file immediately). The page is structured in the same way as our webpage on www.albiruni.nl. The works will be listed and for each work we give editions of the Arabic text, translations, a selection of modern articles, and then Arabic (or Latin) manuscripts with links to facsimiles if the manuscripts are online. Some abbreviated references (such as GAS, RI) are explained at the end of this page. G.J. Toomer, article "al-Khwarizmi" in Dictionary of Scientific Biography (produced by machine reading, with many miserable spelling errors which do not occur in the printed original). Sonja Brentjes, article "Muhammad ibn Musa al-Khwarizmi" in Thomas Hockey et al. (eds.) The biographical Encyclopaedia of Astronomers, New York: Springer Verlag, 2007, pp. 631-633. The same biography in the ISMI biography website (Berlin). More online sources: see below. Standard bibliography: GAS 5, pp. 228-242, GAS 6 pp. 140-143, GAS 7, pp. 128-129. RI no. 41, pp. 21-26 (not always accurate). A very large annotated bibliography of studies on al-Khwarizmi before 1983 is in Matematischeskie Traktaty pp. 266-299. Note: there are no authentic portraits of al-Khwarizmi, the portraits on the internet are modern artist's impressions. 1. ARITHMETIC. GAS 5, 240 no. 2, RI p. 22 no. M1. The treatise on computation by Indian numbers has been lost in Arabic but survives in a medieval Latin translation made in the 12th century. The Arabic title is lost, some authors say that it was fI jam` wa-tafrIq but others disagree (RI 22). 1. Edition of the complete Latin text and German translation: Menso Folkerts, Die älteste lateinische Schrift über das indische Rechnen nach al-Hwarizmi: Edition, Übersetzung und Kommentar. München 1997, Verlag der Bayerischen Akademie der Wissenschaften. 3. Kurt Vogel, Mohammad ibn Musa Alchwarizmi's Algorismus. Das früheste Lehrbuch zum Rechnen mit indischen Ziffern. nach der einzigen (lateinischen) Handschrift (Cambridge Un. Lib. Ms. Ii. 6.5) in Faksimile mit Transkription und Kommentar herausgegeben. Aalen 1963. 4. André Allard, Muhammad ibn Musa al-Khwarizmi: Le Calcul Indien (Algorismus). Histoire des textes, édition critique, traduction et commentaire des plus anciennes versions latines remaniées du XIIe siècle. Paris/Namur 1992. 5. Russian translation with commentary in p. 5-19, 109-118, 150-202 of Al-Khorezmi, Matematicheskie Traktaty, Tashkent 1983 (in Russian). Scan. 6. English translation in John N. Crossley, Alan S. Henry, Thus Spake al-Khwarizmi: A Translation of the Text of Cambridge University Library Ms. Ii.vi.5, Historia Mathematica 17 (1990) 103-131, available online (Elsevier open archive). 1. New York, Hispanic Society of America, HC 397/726, ff. 17a-24b. Complete. This manuscript was discovered by Menso Folkerts around 1993. Facsimile of this manuscript in Folkerts, Die älteste lateinische Schrift über das indische Rechnen nach al-Hwarizmi: Edition, Übersetzung und Kommentar. 2. Cambridge, University Library, Ii 6.5, f. 104a-111b. Incomplete, breaks off in Chapter 12. This manuscript has been known for a long time. After the discovery of the New York manuscript it has turned out that the Cambridge manuscript is not the original Latin translation but a later edition, made also in the 12th century. Facsimile of the Cambridge manuscript in:Kurt Vogel, Mohammad ibn Musa Alchwarizmi's Algorismus. (see above). Title: al-kitAb al-mukhta.sar fI .hisAb al-jabr wa'l-muqAbala, Concise book on restauration and confrontation. Sezgin GAS 5 p. 240 no. 1, RI no. 41 p. 22 no. M3. This work consists of three parts: 1 on linear and quadratic equations, 2. on practical geometry, 3. on inheritance problems. Arabic text and English translation: The Algebra of Mohammad ben Musa, edited and translated by Frederic Rosen. London 1831. Digital version. Arabic text: Kitab al-Jabr wa'l-Muqabala, ed. `Ali Mustafa Musharrafa and Muhammad Mursi Ahmed, Cairo 1939. Scan. Arabic text and French translation: R. Rashed, Al-Khwarizmi: Le Commencement de l'Algèbre, Paris 2007. Arabic text and English translation: R. Rashed, Al-Khwarizmi: The Beginnings of Algebra, London: Saqi Press, 2009. Russian translation by B.A. Rosenfeld in pp. 20-34, 118-142 of Al-Khorezmi, Matematicheskie Traktaty, Tashkent 1983 (in Russian). Scan. Uzbek translation by A. Akhmedov in Muhammad ibn Musa Khorezmiy, Tanlangan asarlar: matematika, astronomiya, geografiya. Tarjima, maqola, izohlar (tr. and comm.) A. Ahmedovniki, Toshkent 1983. Persian translation by Husain Khidiw Jam, Mohammad ebn-e Musa Khwarizmi, Tehran 1348 A.H. (solar) / 1969 CE. Scan. Tajek translation in Muhammad ibni Musa Khorezmi. Risolai jabru muqobala wa-Kitob-ul-vasoye. Murattib va muallifi tavzehot I. Khojiyev. Dushanbe 1984. Edition and English translation of the second part (on geometry) in Solomon Gandz, The Mishnat ha-Middot and the Geometry of Muhammad ibn Musa al-Khowarezmi, Berlin 1932, reprinted in F. Sezgin, ed., Islamic Mathematics and Astronomy vol. 5, Frankfurt 1997. Scan. (only the part on al-Khwarizmi). Study on the third part (in inheritance problems) in H. Wieleitner, Die Erbteilungsaufgaben bei Mohammad ibn Musa Alchwarazmi, Zeitschrift für mathematischen und naturwissenschaftlichen Unterricht aller Schulgattungen 53 (1922), 57-67, reprinted in F. Sezgin, ed., Islamic Mathematics and Astronomy vol. 5, Frankfurt 1997, Scan. and Solomon Gandz, The algebra of inheritance, a rehabilitation of al-Khuwarizmi, Osiris 5 (1938), 319-391, online version. Barnabas Hughes, Gerard of Cremona's Translation of al-Khwarizmi's Al-Jabr: A cricital edition. Medieval Studies 48 (1986) pp. 211-263. Scan. 1. Oxford, Bodleian Library, Hunt. 214, 1b-34a. Front page of this manuscript, second page from which the marginalia were removed. A (manuscript) copy of this manuscript is in New York, Columbia University, Smith Or. 40. 2. Berlin, Staatsbibliothek, Landberg, 199, 60a-95b. The digital version of Ms. Landsberg 199, 60a-95b is called " Kitab al-Misa.ha wa'l-wa.sAyA" but it does contain the Algebra by al-Khwarizmi (except the first paragraph). The name of al-Khwarizmi is not mentioned. According to GAS 5, p. 240 no. 1 this manuscript was identified by A. Anbouba, see A. Ambouba, L'algèbre arabe aux IXe et Xe siècles. Aperçu général, Journal for the History of Arabic Science 2 (1978), 66-100, esp. p. 67. The whole Berlin codex Landberg 199 has been digitized , the part by al-Khwarizmi is Kitab fi'l-masaha wa'l-wasaya, Blätter 125-196. Direct link to this part. 5. Tehran, Malik Library, 3418, 16-23, a fragment. 6. 7. Two manuscripts in Kabul, Afghanistan. Medieval Latin manuscripts are not rendered here because the Arabic text is extant. 3. ZIJ (ASTRONOMICAL HANDBOOK). GAS 6, p. 142 no. 1, RI p. 23 no. A1. The astronomical handbook of (al-)Khwarizmi has not come down to us in its Arabic original form but only in medieval Latin translations of revised versions. On the complicated biliographical situation see also: Chapter 3.1.3 (p. 33-35) in David A. King, Julio Samso, Astronomical tables from the Islamic world (750-1900), an interim report, in Suhayl 2 (2001), pp. 9-105, download the whole article, and Benno van Dalen, Al-Khwarizmi's astronomical tables revisited, analysis of the equation of time, in J. Casulleras and J. Samso, ed., From Baghdad to Barcelona: Studies in the Islamic Exact Sciences in Honour of Juan Vernet, Barcelona 1996, vol. 1, pp. 195-252. 2. English translation with commentary in O. Neugebauer, The astronomical tables of al-Khwarizmi, Copenhagen 1962. Here also information can be found on another revision by Petrus Alfonsus, who introduced al-Khwarizmi's work to England in the early twelfth century. Russian translation, with introduction and commentary, in pp. 1-124 of Al-Ghorezmi, Astronomicheskie Traktaty, Tashkent 1983. Scan. A commentary to the astronomical tables of (al-)Khwarizmi by Ibn al-Muthanna (after 1000 CE) is lost in the Arabic original but survives in medieval Hebrew and Latin translations. 1. For the Hebrew versions see the edition with English translation in B.R. Goldstein, Ibn al-Muthanna's Commentary on the Astronomical Tables of al-Khwarizmi, New Haven, Yale University Press, 1967. Russian translation of the trigonometrical part of Ibn al-Muthanna's commentary (predeced by a few chapters of the revision by Maslama al-Majriti) in pp. 86-109, 142-149 of Al-Khorezmi, Matematicheskie Traktaty, Tashkent 1983 (in Russian). Scan..
2. For the 12-th century Latin translation by Hugo Sanctallensis see the edition in Eduardo Millás Vendrell, El comentario de Ibn al-Mutanna a las tablas astronómicas de al-Jwarizmi - Estudio y edición crítica del texto latino en la versió de Hugo Sanctallensis. Madrid, Barcelona 1963. Review by E. Poulle in Revue d'Histoire des Science 18 (1965),411-412 available online. Many later Islamic authors refer to the astronomical handbook of al-Khwarizmi. By collecting all these fragments (which has not yet been done systematically; see for ex. GAS 6 p. 142) much more information on the astronomical handbook can be obtained. 4. USE OF THE ASTROLABE, kitAb al-`amal bi'l-asturlab, book on operating with the astrolabe. GAS 6 p. 143 no. 3, RI p. 23 no. A2. The text is preserved in a unique manuscript (in Berlin) with other material which may or may not be related to al-Khwarizmi but which probably dates back to the same period, see the texts of uncertain authorship (no. 11) below. Arabic text with English translation and commentary: see Text 2 (pp. 115-124, 140-150, 166-173) in François Charette, Petra G. Schmidl, al-Khwarizmi and practical astronomy in Ninth-Century Baghdad. The earliest Extant Corpus of Texts in Arabic on the Astrolabe and Other Portable Instruments. SCIAMVS 5 (2004), pp. 101-198. German translation of only the text on the use of the astrolabe (with perhaps some extraneous material) in: Josef Frank, Die Verwendung des Astrolabes nach al-Chwarizmi, Abhandlungen zur Geschichte der Naturwissenschaften und der Medizin 3 (1922), pp. 1-32. Reprinted in F. Sezgin, ed., Islamic Mathematics and Astronomy vol. 4, 1990-91. Scan. Russian translation by G.P. Matvievskaya in pp. 253-266 of Al-Khorezmi, Matematicheskie Traktaty, Tashkent 1983 (in Russian). Scan. Arabic manuscript: The text by al-Khwarizmi is included in Berlin, Staatsbibliothek, Landsberg 56, 77b-97b, digital version here (large file, pdf) and here for the whole manuscript Landsberg 56. Al-Khwarizmi's text is (in any case) f. 81b-91b. ff. 77b-81a is an anonymous (and very incomplete) introduction on the construction of the astrolabe (almuqantars on the plates and shadow square on the back). This is followed on f. 81 with " Muhammad ibn Musa al-Khwarizmi said... " with instructions on how to use the astrolabe. The instructions end in the middle of f. 91a. For the rest of the manuscript see no. 11 below. A late tenth-tentury (!) Latin translation (with revisions and additions) of al-Khwarizmi's text on the use of the astrolabe is preserved in the Sententie Astrolabii, see Paul Kunitzsch, Al-Khwarizmi as source for the sententiae astrolabii, in From Deferent to Equant, A Volume of Studies on the History of Science of the Ancient and Medieval Near East in Honor of ES Kennedy, Annals of the New York Academy of Science vol. 500 (1987), pp. 227-236. Kunitzch edits the text and translation in parallel columns. Edition of the full Latin text of the Sententie astrolabii in Millas Vallicrosa, Assaig d'història de les idees físiques i matemàtiques a la Catalunya medieval, vol. 1, Barcelona: Estudis Universitaris Catalans, Sèrie Monogràfica i. Scan of the Appendix (varioua Latin astrolabe texts), pp. 275-288 contain the Sententie Astrolabii which Kunitzsch identified as an edited version of a work by al-Khwarizmi. 5. WITTY THINGS ON THE ASTROLABE .Zara'if min `amal Mu.hammad ibn mUsA al-khwArizmI: ma`rifat al-samt bi'l-as.turlAb, Witty things from the work of Muhammad ibn Musa al-Khwarizmi: the determination of the azimuth by means of the astrolabe. GAS 6 p. 143 no. 2, RI p. 24 no. A10. Arabic text with English translation and commentary: see Text 9 (pp. 130-131, 155-157, 181-182) in François Charette, Petra G. Schmidl, al-Khwarizmi and practical astronomy in Ninth-Century Baghdad. The earliest Extant Corpus of Texts in Arabic on the Astrolabe and Other Portable Instruments. SCIAMVS 5 (2004), pp. 101-198. Russian translation in Mukhammad ibn Musa al-Khorezmi, k 1200-letiyu so dnya rozhdeniya, Moscow 1983, pp. 216-221, Scan. Arabic manuscript: Istanbul, Süleymaniye Library, Ayasofia 4380, 198b-199a. 6. SUNDIALS `amal al-sA`At fI basI.t al-ru.hAma, construction of the hours on the surface of a plane sundial. GAS 6 p. 143 no. 5. RI p. 25 no. A20. See the detailed description of the treatise by D.A. King. Russian translation in Mukhammad ibn Musa al-Khorezmi, k 1200-letiyu so dnya rozhdeniya, Moscow 1983, pp. 221-234, Scan. Arabic manuscript: Istanbul, Süleymaniye Library, Ayasofia 4380, 231b-235a. 7. JEWISH CALENDAR. 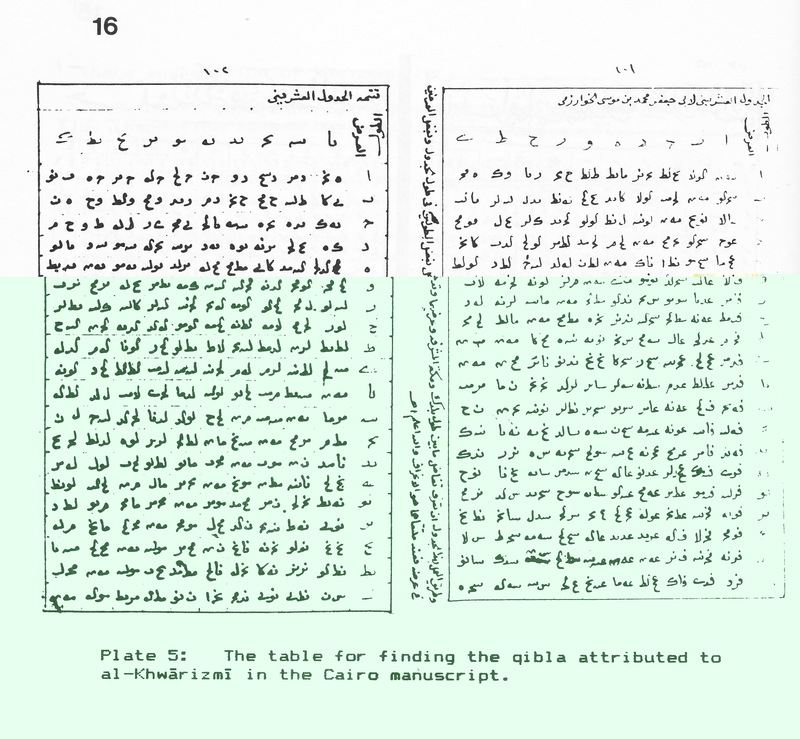 risAla fI istikhrAj ta`rIkh al-yahUd, letter on the extraction of the Jewish calendar. GAS 6 p. 143 no. 4. Arabic edition (not critical) in Rasa'ilu'l-Mutafarriqa f'il-hai'at li'l-mutyaqaddimin wa mu`asiray il-Biruni, containing eleven important treatises on astronomy and other subjects, Hyderabad, Osmania Oriental Publications Bureau 1948, no. 1. Reprinted in F. Sezgin, ed. Islamic Mathematics and Astronomy vol. 74 (Frankfurt 1998), pp. 1-9. Scan. Russian translation, with introduction and commentary, in pp. 24-25, 129-137 in Al-Ghorezmi, Astronomicheskie Traktaty, Tashkent 1983. Scan. Arabic manuscript: Patna, Khuda Bakhsh Library, Bankipore 2468, 115a-117a. Scan. See E.S. Kennedy, al-Khwarizmi on the Jewish Calendar, Scripta Mathematica 27 (1964) pp. 55-59, reprinted in E.S Kennedy, Colleagues and Former Students, Studies in the Islamic Exact Sciences, Beirut: American University of Beirut, 1983, pp. 661-665. Scan. kitAb .sUrat al-'ar.d min al-mudun wa'l-jibal wa'l-bihAr wa'l-jazA'ir wa'l-anhAr istakhrajahu abU ja`far mu.hammad al-khwArizmI min kitAb al-jUghrAfiyya alladhI 'allafahu ba.tlamyUs al-kalawdhI, Book on the Form of the Earth: Cities, Mountains, Seas, Islands and Rivers, extracted by Abu Ja`far Muhammad al-Khwarizmi from the book Geography which was composed by Claudius Ptolemaeus. RI p. 25 G1. Kharazmi's world-map has been reconstructed in detail by Radiya Jafri of the Aligarh Muslim University, and published as : kharI.tah jughrAfiyA-ye jahAn az rU-ye ketAb .sUrat al-‘ar.d KhwArazmI, ta.hlIl enteqAdI wa-tafsIr beh qalam-e rA.diyah JafrI, NashriyAt dAnesh, Doshanbe - Srinagar, 1985. Review of this work in Persian by Hossein Masoumi-Hamadani in Nashr-e Danesh vol. 10 (4), Tehran (1369 A.H. solar / 1990), 80-81.
al-jadwal al-`ishrInI li-abI ja`far mu.hammad ibn mUsA al-khwArizmI, the vicesimal table by Abu Ja`far Muhammad ibn Musa al-Khwarizmi. RI p. 24 no. A4. Arabic manuscript: Cairo, Taymur, Riyada 103/2 (pp. 100-104). Photo of the table in pdf and jpg, from p. of D.A. King, al-Khwarizmi and new trends in mathematical astronomy in the ninth century, New York 1983, p. 16. For the manuscript, see David A. King, A survey of the Scientific Manuscripts in the Egyptian National Library, Winona Lake, Indiana, 1986, p. 192 no. 3.36. The table presents for all 20 values of longitude difference x and 20 values of latitude difference y the angle q(x,y) between the qibla and the south in degrees and minutes. This is for a locality whose geographical latitude is the sum of y and the latitude of Mecca, and whose geographical longitude differs x from that of Mecca. The qibla was computed according to an approximate method equivalent to (tan (q(x,y))=sin(y)/sin(x)), as is shown by the numbers 45;0 in the diagonal of the table. See for the manuscript source and a recomputation of this table pp. 111 (e) and 108-109 (Table 2) in D.A. King, The Earliest Islamic Mathematical Methods and Tables for finding the direction of Mecca, Zeitschrift für Geschichte der arabisch-islamischen Wissenschaften 3 (1986), 82-149. The fact that the table is based on this primitive approximation is an argument against the attribution of it to al-Khwarizmi, because better methods were already available in his time. Al-Khwarizmi wrote a work on History which has not come down to us, but which is quoted by several later historians. The fragments have been collected in Russian translation in Mukhammad ibn Musa al-Khorezmi, k 1200-letiyu so dnya rozhdeniya, Moscow 1983, pp. 234-260, Scan. Abu Kamil in his algebra refers to Muhammad ibn Musa al-Khwarizmi's summation of the successive powers of two in connection with grains on a chess-board, see pp. 724-726 in R. Rashed, ed., Abu Kamil, Algèbre and analyse diophantienne, Berlin 2012. Russian translation of the fragment in Mukhammad ibn Musa al-Khorezmi, k 1200-letiyu so dnya rozhdeniya, Moscow 1983, pp. 213-216, Scan. (the second fragment. The first fragment is taken from the Latin version of al-Khwarizmi's Arithmetics, but Menso Folkerts argues that this part may be an addition made by the Latin translator, and that the "work on arithmetics" was written by a Western author, not al-Khwarizmi. See pp. 30-31 and 112-113 in M. Folkerts, Die älteste lateinische Schrift über das indische Rechnen nach al-Hwarizmi: Edition, Übersetzung und Kommentar. München 1997). According to D.A. King, al-Khwarizmi and new trends in Mathematical Astronomy in the ninth century (New York 1983) p. 29, Al-Marrakushi refers to the sine quadrant as the "sine of al-Khwarizmi"
Berlin, Staatsbibliothek, Landsberg 56, 77b-97b, pdf of the whole manuscript (large file). For f. 77b-91a see Al-Khwarizmi's treatise on the use of the astrolabe (text no. 4 above). Tashkent, Al-Biruni Institute, no. 177/3 (f. 148a-151a). For a description of the Istanbul and Tashkent manuscripts with a detailed list of all the texts, see: A. A. Ahmedov, J. ad-Dabbagh, B.A. Rosenfeld, Istanbul manuscripts of al-Khwarizmi's treatises, Erdem 7 (1983) pp. 163-186, Scan. The texts in ms. Ayasofya 4830 and ms. Taskhent 177/3 are numbered 1-59 (this will be called the "Ahmedov-Dabbagh-Rosenfeld numbering"). Text no. 39 (Witty things) and nos. 52-59 (Sundials) are authentic texts by al-Khwarizmi (see no. 5 and no. 6 above). Turkish translation of this article by Prof. Melek Dosay in Erdem 7 (1983) pp. 187-210, Scan. Arabic edition and English translation of part of the corpus (the Berlin ms. plus Ayasofya 4830, 193a, 196b-197a, 198b-199a) in François Charette, Petra G. Schmidl, al-Khwarizmi and practical astronomy in Ninth-Century Baghdad. The earliest Extant Corpus of Texts in Arabic on the Astrolabe and Other Portable Instruments. SCIAMVS 5 (2004), pp. 101-198. Analysis of part of the corpus in David A. King, al-Khwarizmi and new trends in mathematical astronomy in the ninth century, New York 1983, Hagop Kevorkian Center for Near Eastern Studies, Occasional Papers on the Near East no. 2, 43 pp. Nos. 31, 36, 39 (Arabic text and English translation) in François Charette, Petra G. Schmidl, al-Khwarizmi and practical astronomy in Ninth-Century Baghdad. Nos. 22, 1-4, 32 (Arabic text and English translation) in A. A. Ahmedov, J. ad-Dabbagh, B.A. Rosenfeld, Istanbul manuscripts of al-Khwarizmi's treatises. No. 36, 22-24 are analyzed in Chapter 3 of King, Al-Khwarizmi and new trends. A Russian translation of most of the corpus seems to exist in A.A. Ahmedov, Traktaty al-Khorezmi ob opredelenii azumutov y vremeni, in Materialy po istorii nauki i kul'tury narodov Srednei Azii, Tashkent: Fan, 1991, pp. 155-200 (not seen). Also interesting might be: A.A. Ahmedov, J. ad-Dabbagh, B.A. Rosenfeld, Makhtutat rasa'il al-Khwarizmi fi Istanbul wa-Tashkand, Abhath Jadida li'l-musta`ribin al-sufyati (Noviye issledovaniya sovetskikh arabistov, Moscow) 3 (1989), 48-74 (not seen). Al-Khorezmi, Matematicheskie Traktaty, Tashkent 1983 (in Russian). Scan. Al-Khorezmi, Astronomicheskie Traktaty, Tashkent 1983 (in Russian). Scan. Mukhammad ibn Musa al-Khorezmi, k 1200-letiyu so dnya rozhdeniya, Moscow 1983, Scan. B.A. Rosenfeld, N.D. Sergeeva, Ob Astronomicheskikh Traktatakh al-Khorezmi Istoriko-Astronomicheskie Issledovaniya 13 (1977), 201-218. Scan. Jeff Oaks, Was al-Khwarizmi an applied algebraist? GAS = F. Sezgin, Geschichte des arabischen Schrifttums. GAS 5 = Band 5, Leiden: Brill, 1974. GAS 6 = Band 6, Leiden: Brill, 1978. GAS 7 = Band 7, Leiden: Brill, 1979. RI = B. Rosenfeld, E. Ihsanoglu, Mathematicians, Astronomers and Other Scholars of Islamic Civilization and their works (7th-19th century), Istanbul 2003.